The world’s billionaires can pretty much afford anything they want from the rarest diamonds to private jets to the most luxurious apartments, super fast cars, and even super motor yachts. They never get tired of adding to their expensive toy collection. But hey, you know what they say; “work hard, play hard”. It is an arguable point that one of the things that qualify you to the league of top billionaires is the ownership of a super luxury yacht. These floating mansions are absolutely magnificent having every ultra modern amenity you can find on land, from helipads to swimming pools to basketball courts, they have it all. Its interior designs could downplay those of the most luxurious hotels around. Let’s take a look at the top 15 most expensive and largest yachts in the world which are collectively worth a massive $5.5 billion. Launched officially in 2003, the octopus was custom-built by German shipbuilders Lurssen for Microsoft co-founder Paul Allen. It measures 126 m and features 41 suites, a cinema, a recording studio, a basketball court, a glass bottom swimming pool, two helipads, and two submarines. Apart from the occasional party its owner hosts on the yacht, it is regularly given out for scientific researchers and rescue missions. The yacht has the capacity to accommodate 26 guests and 57 crew members. 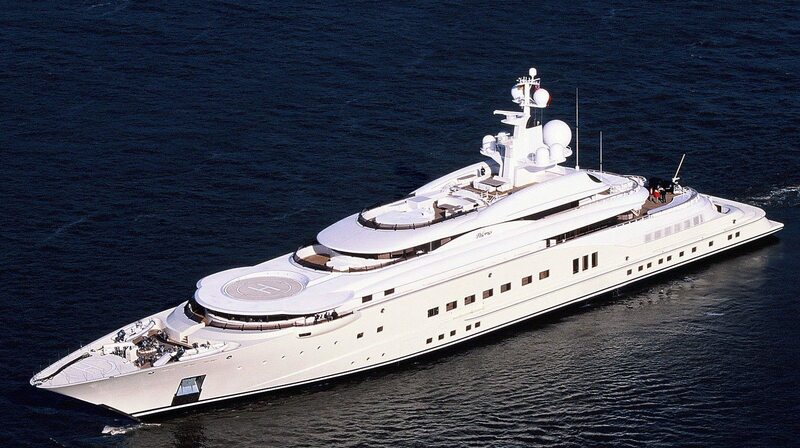 The Rising Sun was designed by Jon Bannenberg and built by Lurssen for its original owner- Oracle’s Larry Ellison. Built in 2004, it underwent a revamp in 2007 and in 2010 the motor yacht was acquired by Hollywood tycoon David Geffen. The 132 m long floating mansion has 82 rooms spread over its five floors. With extraordinary features including a basketball court/helipad, cinema with massive plasma TV, wine cellar, gym/spa/sauna, and Jacuzzi bathrooms, this extensive yacht could pass for a modern hotel. Writer, director and business magnate Steven Speilberg needed a yacht for his personal needs so he hired Oceanco to do the construction. Steve’s yacht features his own personal suite and 6 others that can house 12 guests, a swimming pool, gym, helipad and a movie theatre. There is also enough space for the 23 crew members available onboard. Lady Moura was launched in the early 90’s and is the private property of Nashir Al-Rashid, an advisor to the Saudi royal family and founder of Rashid Engineering. Though little is known about this yacht, it is a fact that the entire vessel was made out of steel and her name found on the stern, port and starboard are all written in 24-karat gold. So if Rashid could afford gold for the writing of his yacht’s name, then I won’t be wrong to speculate everything inside this yacht could be bedazzled. Hamad Bin Jassim bin Jabor Al Thani is the former prime minister of Qatar and the owner of this luxury yacht designed by Tim Haywood and built-in Wewelsfleth, Germany by Peters Schiffbau. The 133 m long yacht which can accommodate 24 guest boasts 10 suites with ensuite bathrooms, living rooms and bedrooms with 2 VIP suites belonging to its owner. There is also a movie theatre, indoor pool, outdoor jacuzzi, sun decks and a helipad. There are 55 crews onboard with their own rooms. Russian billionaire investor named his $263 million motor yacht after his mother. The yacht built by Germany’s Lurssen can house up to 20 guests and 47 crew members. It features a pool, helipad and a deluxe dining area. Its interiors were designed by the legendary French designer Alberto Pinto. Pelorus was originally owned by Russian billionaire and Chelsea FC owner Roman Abramovich, after his ex-wife acquired the yacht as part of her divorce settlement, she sold it in 2011 to Media tycoon David Geffen. The yachts’ interiors designed by Terence Disdale has rooms that can carry 22 guests, and 42 crew members. There are two helipads, a large pool, an extensive toy room and a jacuzzi. Back in 2005, Roman offered this yacht to Chelsea footballers Frank Lampard and John Terry for a period of two weeks as a perk for being Chelsea’s best players in the 04/05 season. The yacht’s owner Qaboos bin said is the sultan of Omar and one of the wealthiest royals in the world. His eponymous yacht is one of the world’s longest at 155 m and can accommodate 70 guests and 174 crew members. It touts every modern amenity you can think of. When you’re a Sheikh, Prime Minister and Vice President of the UAE you have the power to own a luxury yacht named after your city. At 162 m long Dubai is the third largest yacht in the world. Dubbed the floating city, it boasts a pool, spa, helipad, a submarine, squash pad, and every other thing you’d find in a city. Its interiors designed by Platinum Yachts has all it takes to cater for 115 guests. This mega yacht isn’t named Dubai for nothing. A property of another Arab billionaire investor Abdullah Al Futtaim. It was designed by Tim Heywood and constructed by world-renowned Lurssen shipyard in 2009. Radiant can accommodate a guest list of 16 and a crew of 44. Built by Italian Fincantieri and having a length of 134 m, this is one of the world’s largest yachts, and it is owned by Russian vodka magnate Yuri Scheffler. This superyacht has seven decks with 12 cabins capable of housing 24 guests. Its facilities include a submarine, pool and two helipads. There are 54 crew members onboard to ensure smooth sail. In 2014, world’s richest man, Bill Gates borrowed this yacht for a summer treat and paid a whopping $5 million per week. This spectacularly unique yacht was designed by Martin Francis and Philippe Stark and constructed by Germany’s Blohm + Voss. Named after the initials of its Russian billionaire owner, A has one private suite and six other suites that carry up to 14 guests. Dubbed by experts as “most loved and loathed ship on the sea” A’s interior is groomed with contemporary designs and has every modern facility ready. Superyacht A employs the services of 37 crew members. This 147 m motor luxury yacht belonging to Mansour bin Zayed- the deputy prime minister of UAE is the fifth largest private yacht in the world. Topaz has seven decks and is equipped with a jacuzzi, large conference room, tender garage, a pool with a platform, a gym, movie theatre, two helipads and more. It was built by Lurssen and designed by Tim Heywood (exterior) and Terence Disdale (interior). At 180 m Azzam holds the title of the world’s largest private luxury yacht. Launched in April 2013, this 50 suite superyacht took Lurssen a record of 3 years to construct. Azzam features the most sophisticated facilities which include its own missile defense system, a bulletproof suite for its owner, a mini-submarine, two pools, two helipads, a cinema, and surveillance cameras. With all that to accommodate, Azzam can still navigate at a top speed of 30 knots. Its owner Khalifa bin Zayed is the president of the UAE and Emir of Abu Dhabi. Though this title was previously held by Azzam, Eclipse underwent modifications that shot up its price tag. Measuring 163.5 m, eclipse is the second largest private superyacht in the world. And what exactly does the world’s most expensive yacht contain? – A missile defense system, intruder detector, (safety is guaranteed) anti-paparazzi system (yeah! no illegal photo snapping allowed), two swimming pools, a mini-submarine, two helipads, gym, sauna, dance hall, cinema, beauty saloon, playroom, conference hall, I could go on. Eclipse has not less than 30 suites with a private bulletproof suite for Abramovich. It was built by Germany’s Blohm + Voss.